- a breakdown of the money owned on the server, character by character. - remove money data from a (possibly deleted) character. - switch between various display modes. If you have AddonLoader, this addon will load as delayed. - Fixed issues where removing a toon or logging a toon unknown from AraBrokerMoney was affecting the balance history. - Added option "Calendar mode" to switch between "Last 7 days / Last 30 days" and "This week (starting monday) / This month (starting the 1st)". - Added option "Thousand separator": Space (default), Comma or None. - Added support for !ClassColors. - Added optional dependencies: NazScrooge and the buggy DepositBox!. - Fixed the day to end at midnight for everyone, not only french people (my bad :p). - No, wait, I also tried to make the day end at midnight, taking daylight saving time into account, for the obsessivly compulsive people outta there. - Fixed some display modes so that, for exemple, 0c doesn't read as 0g 00s 00c. - There's now 2 distinct display modes: one for the block and one for the tooltip. - Fixed an issue where a fresh install of r4 was not setting a default display mode. - Better implementation of display modes. - Added "this month" (rolling last 30 days) to the balance history. - Added some display modes. - Added class coloring. It's not retroactive: you will have to log your alts to get their class color. - Fixed a rare bug due to a global variable that should have been local (not confirmed). - Fixed X-Credits in TOC file. - Added an option to switch between normal and compact display mode. Hi Ara, would be fantastic if you could update this one! I tried all the others like Broker_Currency Broker_Money & Broker_MoneyFu but I prefer yours! Could u please update this one? I'm getting tooltip flicker after mousing over the datatext and then mousing over actionbar slots and itemlinks in chat. I have no idea how to fix it and I'm not getting errors that I can report. Quick bug report. If the total cash is over 1,000,000, it's formatted wrong. It appears as 1000,000 (note the missing comma). By the way, I have lots of unfinished versions to share. IIRC the money one was splitting money between faction successfuly in most cases and I was in final test phase and working on display options and tiny details for quality release. For those adventurous enough, you can try it at your own risk (save your config file before ? ): Ara_Broker_Money_a13.zip. It seems the author has quit playing wow, so there is no further development i think. Any idea on the ETA of separating out Horde and Alliance characters on the same server? The last time I asked, you mentioned doing it before Cata was released. I have a suggestion to add [Horde] and [Alliance] or something (maybe also add a total amount on each faction). I would like that too. 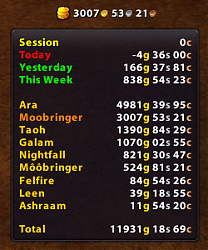 I have no use of knowing on my ally char, how much gold my horde has. It only shows the NET RESULT of the session/day/week, like "-100g". This is not very useful since it doesn't show what HAPPENED. Here is how FuBar_MoneyFu displayed this type of data, note how it changes between "loss" or "profit" for the 3rd "summary" line depending on if it was an overall loss or gain. 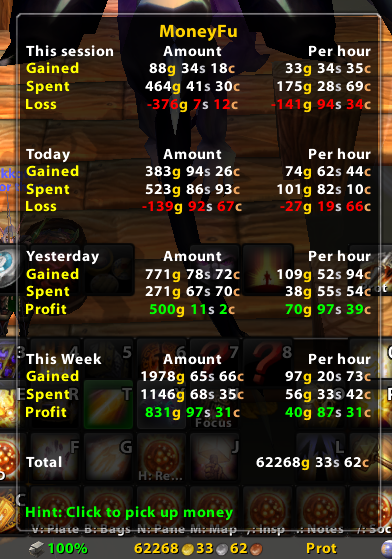 Also note that it has "per hour" statistics on the right which may seem like a good idea at first but is actually completely useless (it jumps up wildly when you open money from AH mail, and it really only has a purpose for grinding mobs and looting gold, but even then it doesn't take into account the money you will be getting from drops later, so per-hour statistics are uselessly inaccurate in absolutely EVERY possible usage scenario). Last edited by Yewbacca : 01-13-11 at 08:19 PM. - Option to filter out specific transactions (like putting money on guild bank). - Option to add Guild Bank money to the tooltip sum. Last edited by Naem : 11-12-10 at 02:28 PM. I was lazily using a Blizzard function to format with icons, but I feel you and I will write a better one. I don't want to mix gold and currencies, but I will add the currency panel toggle as I don't have anything else to put there. I'm working (sometimes) on a separate currency broker, but I don't think it will be as good as Torhal's Broker Currency so give the later a try. Not yet, but it's planed for next release (should be before cataclysm). Last edited by Aranarth : 11-03-10 at 12:05 PM.